I’m going to try to maintain an optimistic outlook on this year’s FFF as only an angsty teenager can, espcially since I enjoyed last years FFF so much. This means I’m obviously not going to complain about how sexually explicit some of this year’s entries look or how not even half of them look appropriate for someone my age. I’ll simply keep hoping that intriguing documentaries like First Position and thrillers like Stuck are just as amazing as many of the clean films I saw last year. I’ve always looked forward to Short Films in the past because I found them easy to follow, quick and to the point. However, I’ve always wondered why the FFF doesn’t ask the filmmakers to put ratings or extreme content warnings before their film plays. Two years ago, I was watching Foreign Shorts with my parents and a friend. We were somewhere around the 3rd or 4th short and, so far, they were all very entertaining. Suddenly, one starts playing that is so sexually explicit that my mother has to remove my friend and I from the theatre to shield our innocent 15 year old eyes and ears. It completely ruined the experience of the FFF shorts to the point where I’m discouraged from returning to them this year. It’s that time of the year again. 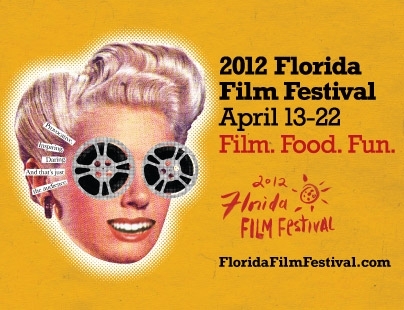 The 2012 Florida Film Festival is right around the corner. Wednesday was the Official Sneak Preview for this years FFF. I attend along with LanceAround and Number One Daughter. We got to watch a couple shorts and a lot of trailers, but it was really just a tease of what’s to come. This year features 168 films from 31 countries out of over 1,700 entries. Based on the previews I saw, here are some of my ‘must sees’ of this years festival: Headhunters, First Position, The Gruffalo’s Child, God Bless America, and John Dies at the End. God Bless America is on my list because of my sick sense of humor (or other people’s lack thereof.) The blood was initially what caught my attention, but it also seems to have a comedic twist about it where I just can’t help but laugh. I recently started watching a TV show called White Collar. It’s about an art thief and counterfeiter who gets caught and works for the FBI. When I saw the preview for Headhunters, I was automatically drawn to this film for the resemblance and the action. You can’t live a luxurious lifestyle without stealing art, right? 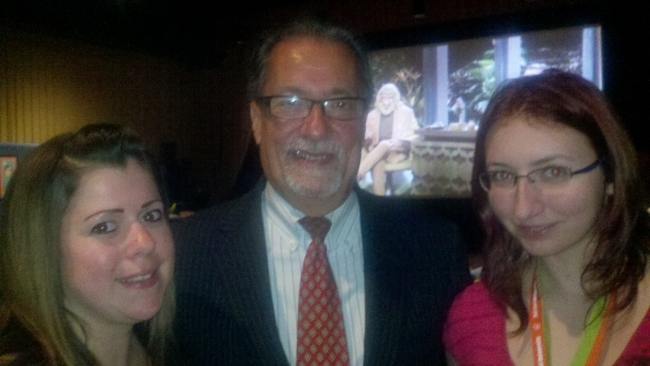 After the Sneak Preview Henry Maldonado, the President of the Florida Film Festival, stops by our table to say hello. Henry’s enthusiasm is always infectious. He really loves movies. Although he even teases himself about his propensity for going on and on as he speaks, it always makes me smile to see what a big kick he gets out of every film he sees. Henry asks us to reach out to all our readers and remind them that the Florida Film Festival is very personable and friendly. Tickets are only $10 a film; about the same as any other night at the movie. And these are excellent films that rarely don’t get seen in wide release at your local theatre. 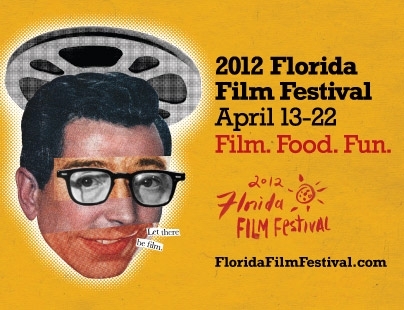 If you’ve never seen a movie at the Florida Film Festival, Henry asks us to remind you to give it a try this year. LanceAround promises Henry we’ll spread the word for him. My personal love for horror films continues to grow every day, and this year appears to have some ‘mind blowing’ films that I must see! April 13 – 22 can’t come soon enough for me. I hope to see you there. For the third year in a row from April 13 -22, 2012 the LanceAroundOrlando blog team is proud to be an official blogger for the annual Florida Film Festival. I go with SunnyStefani and Number One Daughter to the Official Sneak Preview for the FFF, which is held at the Enzian Theatre in Maitland, just north of Orlando. The theatre is packed with various journalists, sponsors, volunteers and FFF staffers. Every year the festival grows larger and larger. There’s a palatable buzz in the air that only occurs in an event like this where film lovers of all types get together to share their joy for this remarkable industry. Just Three More Weeks Before the FFF! But his message is clear–this festival is one designed for people who truly love movies and who simply enjoy a great night at the theatre. Tickets to each individual movie or selection of short films are cheap and the films are usually independent movies that can’t be seen at your local multiplex theatre. Henry says that many people who live in the area still don’t know how easy it is to come and see a wonderful film that seldom makes it into wide release. Henry pauses to get a photo with SunnyStefani and Number One Daughter then moves on to the next table. SunnyStefani will put that photo into her next post. I manage to get the attention of Matthew Curtis, the Programming Director for both the FFF and the Enzian Theatre. Matthew has seen pretty much every movie that goes through the festival and the Enzian as well as hundreds of others that don’t make it onto the screen. He’s a classic film aficionado who has a remarkable memory for all the movies he’s seen. “Depends on your taste,” comes the almost predictable reply. 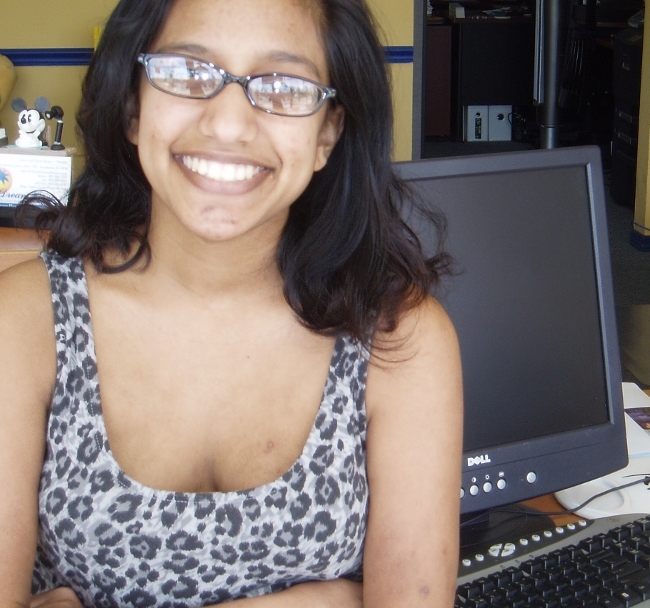 “Mamitas is a narrative feature. There’s also An Ordinary Family and The Brooklyn Brothers Beat the Best.” He continues, “Give Up Tomorrow, Salaam Dunk, oh, and Kumare is hilarious.” I nod, I’m finally getting the best of the best–a list of “must see” movies. But Matthew is only taking a breath. He continues, “The Shorts this year are amazing. Animated Shorts are hilarious. The International Animation are incredible.” I scribble a few notes. Matthew is still talking. “Under African Skies is one you can’t miss. Paul Williams Still Alive is a great documentary.” He’s speaking faster than I can write. 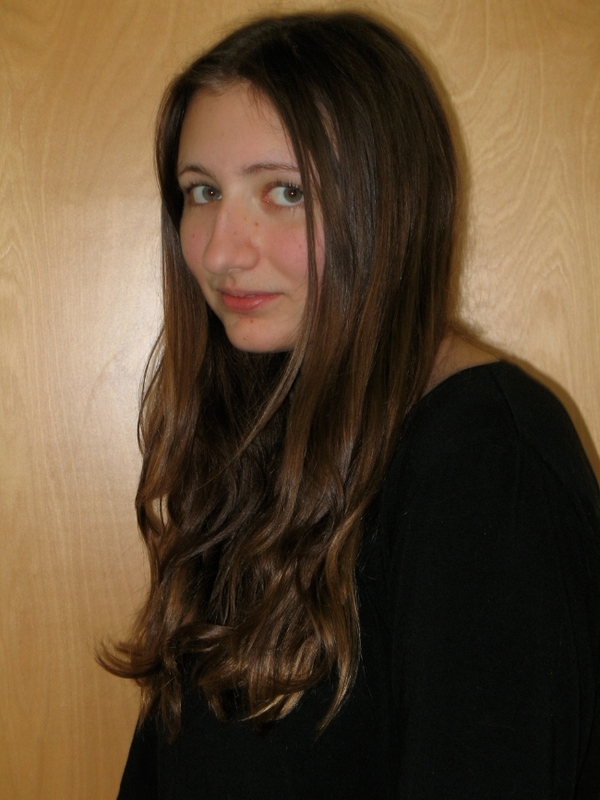 “First Position is a wonderful family film. It’s like Spellbound only with ballet,” he says. “Monsieur Lazhar. Headhunters. These are fun thrillers that keep you guessing…” he continues. I can no longer keep up with all the movies he is recommending. Like most Enzian aficionados, there’s no end to Matthew’s ability to talk about movies. I suddenly realize he’s not going to stop. It’s pointless anyway. I asked Matthew to give me a list of films not to be missed–but that was unfair! I now understand that, for Matthew, there is no such thing as a film in this festival that isn’t good. He wants everyone to see them all! It makes sense, if you think about it. A submitted film has less than a one in ten chance of making it onto the festival schedule. All the movies in the FFF are worth seeing. With odds like that, you can’t go wrong. 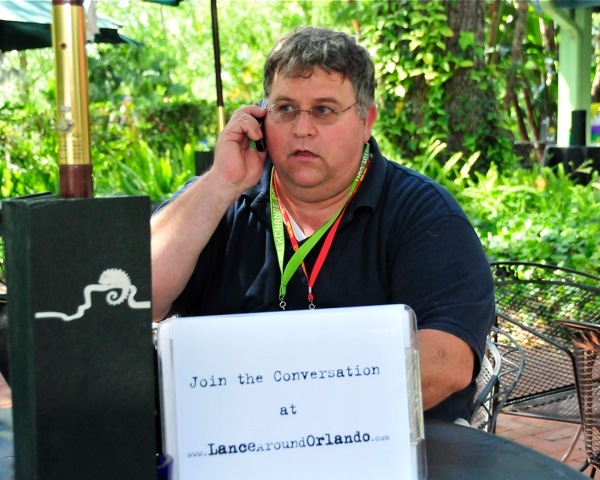 And when you do see a movie at the FFF, be sure to find a member of the LanceAroundOrlando Team and let them know your thoughts about this year’s festival. Oh, and if you run into Matthew–let him know which film YOU liked the best! Hello LanceAroundOrlando readers! Since I haven’t had the opportunity to personally meet you, I just wanted to say how awesome it is to get to share my thoughts with all of you remarkable people. I was born and raised in Central Florida, home of Mickey, Minnie, Shamu, and now Harry Potter! Growing up, all anyone ever hears about is the Theme Parks; I’ve been hearing it for years and years! No one seems to remember us Sports Enthusiasts. Those of us who enjoy basketball take that with a grain of salt. Whoever said Orlando was all about the mouse probably never thought they would see the day when the NBA All Star Weekend would make its return to the City Beautiful! I, for one, can say that the City Beautiful rose to the challenge magnificently. For weeks before the hordes of fans and countless celebrities arrived the city was buzzing with preparations; making our city even more beautiful and, most importantly, safe for everyone coming to enjoy the festivities. Now most of us here can only dream of being courtside at the All Star game (or even in the nosebleed seats.) Thankfully, for us there were a ton of celebrity hosted events all around the city, ranging from charity volunteer events to unforgettable club nights. Needless to say All Star Weekend brought everything it promised to Orlando. All Star Weekend showcased many of the awesome things Orlando has to offer; hosting events such as the All Sports All Art Sports Fan Happy Hour which showcased sports related artworks. Also Thursday night Dwayne Wade and Orlando’s own Superman Dwight Howard hosted events at Club Vain and Club Roxy kicking off All Star Weekend in spectacular fashion. Undeniably one of the most memorable events was the concert that took place in front of the Amway Center, preceding the All Star game. Fans stood shoulder to shoulder as they got to hear incredible performances from chart topping artists, two of the most memorable being Lil Wayne and Nicki Minaj. For those of us who could only hope and dream of going to see the BBVA Rising Stars Challenge, the three point shoot out, the slam dunk contest, and/or the skills challenge, the charity and club events provided us with a way to get the most out of the weekend as well! When I say those of us, I include myself because, unfortunately due to some unforeseen super complicating circumstances, I got to enjoy hearing stories about the festivities from family and friends but could not attend them personally. For those of you who are just as green eyed as I am, I hope to see you in Houston next year for All Star Weekend 2013! Now Orlando is getting back to as “normal” as we get, with the Spring Break crowds invading and the super busy Easter tourist week ahead. But the Slam Dunk that All Star weekend made will not soon be forgotten. 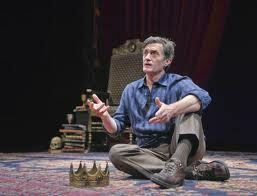 Roger Rees comes out of the theatre to greet Mrs. LanceAround, Number One Son, Number One Daughter and I. He is the Tony Award winning actor of Nicholas Nickleby. Most American audiences know him for his role as Lord John Marbury on the TV show West Wing. I was instructed that he only had a “minute or two” and I am not permitted to take any photographs. How can I possibly get a worthwhile interview with such restrictions? He approaches me and I take a deep breath. “Roger, I don’t like you very much,” I begin. Roger gives a “hmmm”. He’s enough of an actor to recognize a set up. “You see, ever since my wife saw you play Lord John Marbury on West Wing, she’s been rather smitten by you.” Roger, along with the entourage of people around us, breaks into laughter. “Is this your lovely wife?” He asks, gesturing to Mrs. LanceAround. “Yes,” I reply, “and this is my Number One Son and Number One Daughter.” The ice has been broken and there are handshakes all around. I’m able to begin the interview and, as I suspected, he generously gives me more than just a minute or two. “Tell me what message you have for my readers,” I ask. Roger, who appeared tired after his hour and a half one man show, suddenly becomes more animated; his body fills with energy. “Tell them Shakespeare is nothing to be afraid of,” he begins. Visibly passionate, he talks about how he loves to teach high school and college students. “People think Shakespeare is poetry and they are not allowed in,” he laments. 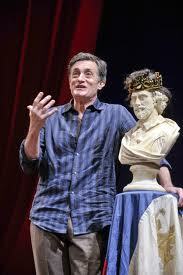 His vision is to allow students to “play” in Shakespeare. To help fulfill his vision, Roger is currently touring the world with his self created one man show, What You Will. The play is a collection of Shakespearian soliloquies and poems interspersed with personal stories and researched articles about Shakespeare. He then allows the audience to ask questions. One theatre goer remarks that you can tell his cultural prowess when you realize that he only knows Roger from his role in Mel Brook’s movie Robin Hood Men In Tights. Upon hearing this, Roger walks through the aisle and gives the man a high five to the laughter of the crowd. He then speaks about working with Mel Brooks whom he refers to as the funniest man on the planet. 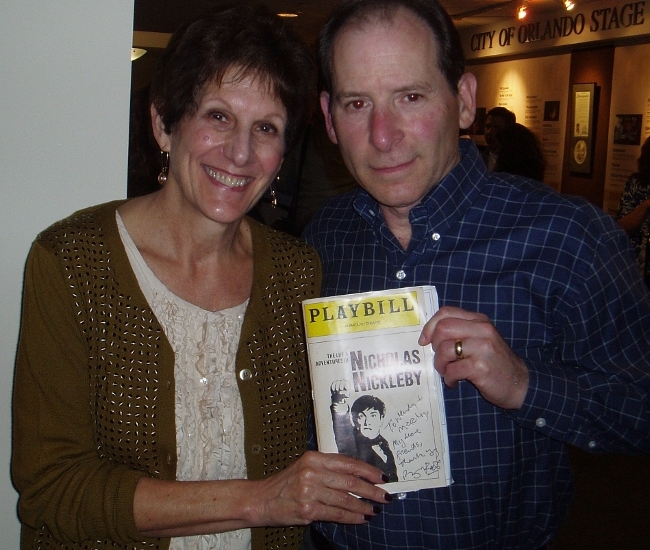 Marty Derrow rises to tell Roger that he and his wife, Wendy, went to New York for their 10th anniversary to see his performance in Nicholas Nickleby. This ambitious show from the Royal Shakespeare Company in England is nine and a half hours long. The show was so long, the audience was given several breaks during the performance and presented with a list of nearby restaurants where they could grab a bite to eat before the next act. After my interview with Roger, I spend some time talking with Wendy and Marty. 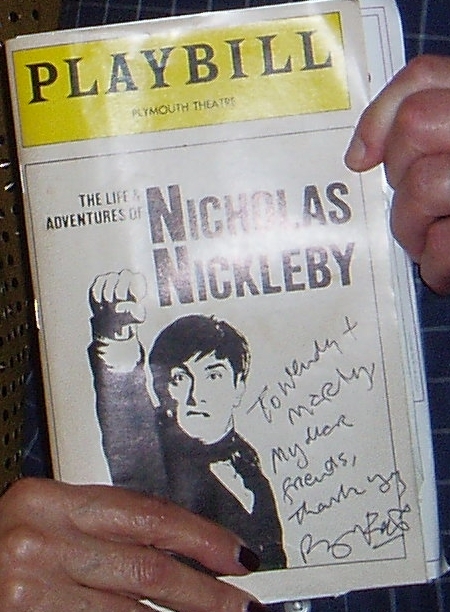 They tell me that Nicholas Nickleby was an astonishing piece of theatre and Roger was fantastic. There were about 25 members in the cast and each one had to perform two, three or even four or more different roles; except for Roger. He was Nicholas Nickleby throughout the entire show. I can’t imagine how much energy it takes to perform for over 9 hours on the Broadway stage. However, in a little over a month Roger turns 68. Based on the energy he brought to his performance of What You Will, it’s evident he has what it takes.